I finally got a doll out today…they’re still packed with all our stuff in our living room, but hopefully I can get them all out soon and set up their corner/room/where they live. Hopefully that will be in a week, because, in exactly a week in Josefina’s birthday! I want to throw her a party on St. Patrick’s day though, so it can be St. Patrick themed. I have so many ideas, but, what if nothing’s ready in time? ughhhh it’s all so confusing! 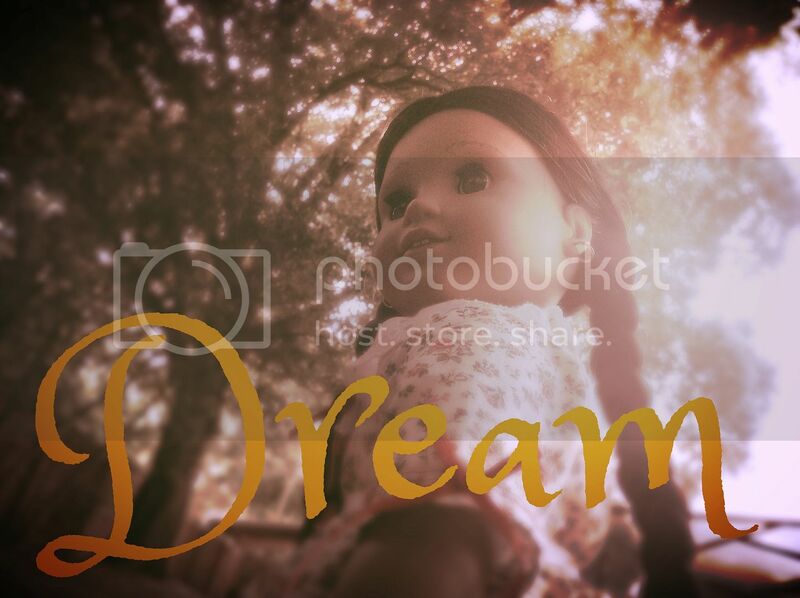 Anyways, I took Josefina out for a mini photoshoot. Here are her photos! Here are some edited photos. Thank you! LOL yes that made sense. 🙂 Josefina says Gracias 🙂 yes, that photo is my favorite of all the edited photos! How cute! I know what it is like to move. Uhhhh!!!!!! I hope you can throw your doll party! Thank you! Yes, frustrating and heartbreaking right?! Yes! Moving is very heart breaking! And if you want to check out my blog, then just click my name. It is! Last night, I was crying because I missed everything. I call it Silent Sobbing (cause I didn’t want to wake anyone up.) 😛 I feel better now, but I was really sad last night. I didn’t make a new blog but I did change the theme! Oh ok! By the way, there’s this error on your blog. I can’t comment anymore. I’ve tried it on two different devices and two different web browsers. Just letting you know. 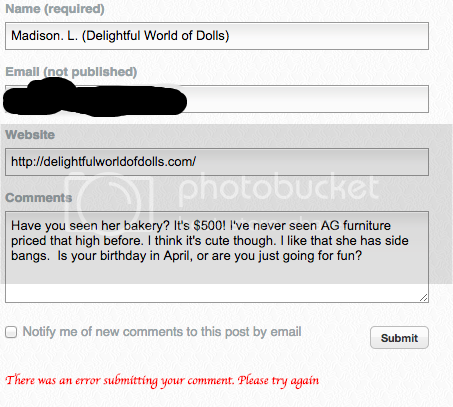 There’s an error on your blog – it won’t let me comment anymore. Oh, ok I will check that out! Thanks for telling me and tell me if it works! Ok! No problem! I will! Well, I did check it out by clicking my name and posted a comment and it worked for me. Tell me if it works! Maybe you have it set up where it won’t allow more than a few comments on a certain post? You could probably check your settings and you might see a problem there. Ok I will see! Thanks! Well, I went into the settings and I changed a few things. Maybe try posting a comment on a old post and see if it works. Thanks again! Hmmmmm… I tried commenting again on your very first post. It still won’t let me submit my comment. I’ll just have to get on the case! What does it say and look like when it says you can’t comment? I change a setting on my blog that I have to approve comments. See if that works! Oh, ok! And I read the comment you were trying to post and yes the bakery is way over priced! My birthday is in June and I am just going for fun! Agreed. I mean, even $200 would still be like…woah. Ok thank you I will try to get it fixed! Sorry to interrupt you and Nikki’s conversation, but my B-day is also in June! Wow! Yes! June b-day do rock! I think I fixed it now! Wow! Compared to me (0 awards) you have alot! Good job on all of them! At least the comments are working! Thanks Allie! I am soooo excited. I am even more excited for when I go to Texas! EEEEK just a few more weeks ok I am counting down the days until I see you & Piper again! Thanks! I hope you aren’t too mad about the inconvenience. No problem! Of course I’m not mad. I loved your blog, I’ll be sure to check out the newer one. hi madi i like your posts but can you post something new i love don’t think i mean.